How would you solve this or that problem ? How would you modify, or “enhance” such and such ? 1. Does a vacuum tube exhibit greater “noise” when it is operated with a high anode current at relatively low anode voltage, or when it is operated with a low anode current, but with a fairly high anode voltage ? In both cases the power lost on the tube would be similar ( the multiplication of U and I ) … but when will the noise be lower ? a). Lets assume that there is a small group of say, 100 electrons … and that there, suddenly, appears the “one-hundred-and-first”. This is a 1% change of total charge, a change of granularity (quantization? ), because the additional one that joined the group – has a specific weight and specific charge. 101/100 is the lowest level of granularity here, and the result is a big 1% difference. b). Alternatively, let us now assume that there is a group of 100 000 electrons, and suddenly some kind of stray, unwanted, electron, joins the pack, shouting, “Me too, me too!” This stray, extra electron now introduces an error of 100 001 / 100 000 … or in other terms, 0,001%. This scenario results in a finer “step” within the granularity, a granularity resulting from the fact that a single electron has a very specific charge. A charge, that constitutes a “step” difference, if this electron joins the pack. So it seams to me, if you consider the two of the above scenarios, observed within a very short time interval, that you are looking at: a). a small current and b). a large current. Obviously, any anomalies (thermal, or otherwise) in the case of scenario b). would “yield” a smaller net effect, expressed in percent, or better still: in decibels (dB), upon the total value of the current. A smaller “noise”. So, I presume that the “noise” level of the tube will be “less noticeable” in the case, when you drive it a bit hotter. But not too hot. You do NOT want to shorten the life span of the tube by over-stressing it. Try to stay within no more than 70% of the maximum admissible power rating ( product of: U * I ) of the tube. This will provide her with a long and healthy life. There is but yet a different aspect to driving tubes “hot”. It has been observed, that a majority of tubes tend to “sound” better, when driven hot. And this is not just about “noise”. It is about the “quality” of the sound. People tend to put the operation point of the tube rather “closer” to the maximum allowable power hyperbole line, than further off. It seems that tubes in such regions have a more “even” characteristic, which translates to less distortion of the amplified signal, and, as a result, a cleaner sound. 2. How does a Constant Current Source Work ? Actually, what is depicted on the drawing looks more like a drain to me, like as draining, or “flushing to Ground”, rather than “sourcing from the High Voltage supply”. For the sake of a brief discussion, assume R1 = 70R. R2=200K. So, to solve this riddle, you only need one piece of information: the voltage drop on a conducting base-emitter diode is ~ 0,7Volts (more or less). Let us assume, that both of the transistors are conducting slightly. The Collector of T2 is the stable “current drain”. R2 supplies a fairly high polarization voltage for the base of T2. a). Have a close look at R1. it is connected to a conducting base-emitter diode of T1. So there is a voltage of ~0,7V. It just so happens, that this voltage is ALSO on R1. b). We now know, that the current flowing through R1 is 0,7V / 70 R = 10mA. c). The current “for” R1 is originating from T2, which is conducting. The majority of the 10mA “originates” from the collector of T2, since the base current of this transistor is fairly small. d). The collector of T2 is the current constant current drain. But WHY does it drain a constant current ? I will prove to you that it is constant, because … it is impossible for this current to change. e). Assume: for some unknown reason, the T2 collector current increases. This would imply that the R1 current increases. This would imply that the voltage on R1 increases. BUT …. this is not possible, as even a tiny voltage increase on the base of T1 shall cause it to massively conduct. This would imply that the voltage of it’s collector is massively pulled DOWN, due to the low resistance path to earth and the huge value of R2. But it will be pulled down only a little tiny bit. Since the collector of T1 is connected to the base of T2, T2 shall conduct LESS. The collector current of T2 returns to the point of equilibrium, i.e. to our 10mA. Then, T1 also returns to it’s state of equilibrium. The huge gain of both T1 and T2 is used solely for this purpose, of “returning to equilibrium”. f). Contrary to the above, lets assume: for some unknown reason, the T2 collector current decreases. This would imply that the R1 current decreases. This would imply that the voltage on R1 decreases. BUT …. this is not possible, as even a tiny voltage decrease on the base of T1 shall cause it to stop conducting. This would imply that the voltage of it’s collector rockets sky high, due to the high voltage supplied by R2. But this will not happen. Since the collector of T1 is connected to the base of T2, T2 shall conduct MORE. The base emitter diode of T2 will conduct stronger, and T2 will open up, allowing a greater flow of current from the collector of T2 through R1. The current flowing through R1 returns to the point of equilibrium, i.e. to our 10mA. This also implies that T1 also returns to it’s point of equilibrium. The huge gain of both T1 and T2 is used solely for this purpose, of “returning to equilibrium”. 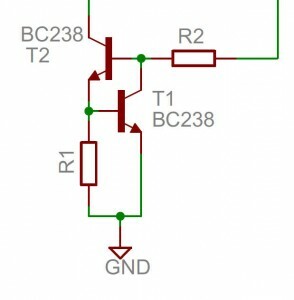 The two transistors are connected, as if each one is eating the others “tail”. This is a very strong feedback loop, established between two transistors, where each has a fairly high gain. The overall gain of the open loop would be the product of the two gains. For example: if beta_T1 = 200 and beta_T2 = 200, then the open loop gain would be, my best guess, in the order of 40 000. But we close the loop and use all that horrendous gain for only one purpose: to control the stability of the voltage over R1. But since this voltage is highly stable, and the resistor is (hopefully) stable, then so is the current, and specifically the one flowing through R1 and through the collector of T2. The current flowing through the collector T2 is STABLE and constant. 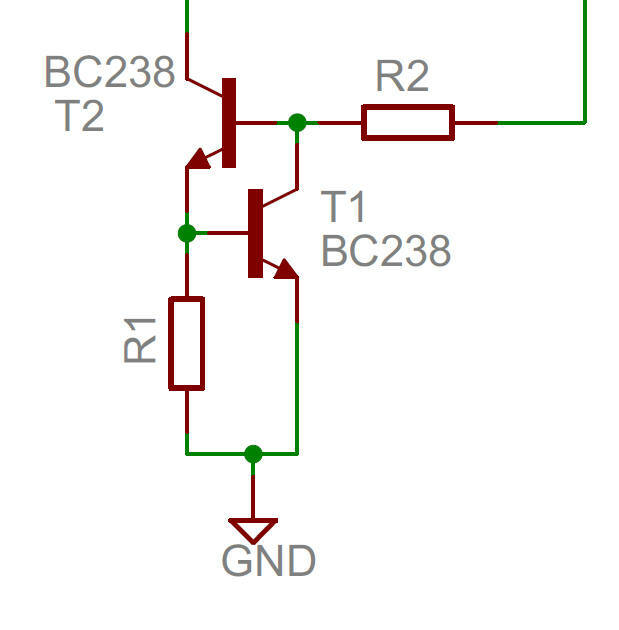 This circuit will FORCE all the other components above it to change their parameters in such a manner, so that they “provide” the needed 10mA of drain current. If it is a simple resistor, the forced change will imply a change of voltage upon that resistor, so as to MEET the demand for the 10 mA of current. Not more. Not less. Exactly what is needed, i.e. 10mA = 0,7V / 70 ohms. Use the R1 resistor to “program” the current of your current drain. One more thing needs to be explained. Why do we use a “huge” value for R2 and connect it to a fairly high voltage ? The high value of R2 limits the current flowing into the base of T2 to one comparable to a trickle. If Beta_T2 = 100, that would be around 10mA/200 = 0,05 mA. Some of the current flowing through R2 gets routed via collector to emitter to ground, via the T1 transistor, if the voltage rises on R1. You could say that T1 is an over-voltage / over-current shunt, that limits the voltage on R2. T1 constitutes, together with R2, a gain stage of very high gain. The slightest variation ( = super super super tiny) of voltage/current on R1 immediately translates to a 200x bigger, but “still” tiny corrective variation on the collector of T1 (= base of T2). A huge value of R2 allows to “maximize” this effect. Then, finally, the “tiny” change of voltage on the base of T2 has a x200 leverage in terms of “correcting” the transistor’s behavior, so as to preserve the “preset” current flowing through R2. Since 200 x 200 is 40000, I presume that the stability of such a current source should be comparable to the “stability” of the resistance of R1, “bettered” by a factor of 40000. Unfortunately, in real life – not so optimistic. There are things such as thermal drift, and this applies both to the transistors, as to the resistors. But none-the-less, You will still be very happy with the final performance of this cute circuit. 3. Some tube amplifiers have a “stand-by” intermediate position between “on” and “off” positions. It is recomended to heat up the tubes, and only then go to the “on” position. But when I am switching the amplifier “off” … should I be switching the amplifier from “on” to “off” instantaneously, or should I allow it a few seconds to rest in the intermediate “stand-by” position prior to switching it fully off ? Let’s face it, that some ready made tube amplifiers, especially those originating from the ‘far east’, do not have a very good design, when it comes to these aspects. So you simply have an “on” and “off” switch, and that is it. When switching to “off” – you basically just disconnect the power supply, the tube heating filaments start to cool down, but you still have the full impact of the anode voltage on the anodes. Why ? Because you have a significant amount of capacitors in your high voltage filter within the HV DC power supply. So, what do you apply ? You apply “hope”. And you apply it as follows: you “hope” that the anode voltage drops in value, which means that the anode voltage conditioning filter unloads the charge of it’s (huge) capacitors, before the cathode turns cold. However, this hope may or may not have merit. If your HV DC power supply filter is a passive one, and has a significant amount of capacitance installed (such as a good passive filter would), then your chances of quickly getting rid of all that stored energy are rather slim. But then again, it is reasonable to assume that the ‘far east’ manufacturers do NOT put in excessive capacitance into thos HV DC filters, in order to cut costs. So it well may be that there is ‘merit’ to your hope, and that there will not be to much damage done. Therefore, for the sake simplicity, just switch it off, or pull the power plug, and be done with it. Well yes. Not big damage. Very small damage. Damage that probably occurs each and every time you switch the unit off. Damage considered as a slow process, that over time (switch-off count) gradually destroys your tubes. Why ? Because tubes generally “do not like” to have a very high voltage on the anode, at a time when their Cathode is cold, or not at the right temperature. That is the reason, why when you switch your amp “ON”, it actually waits a bit for the cathode heaters to fully heat up, prior to applying the anode voltage. Well, OK, switching “ON” is the easy part. You can have timer circuits that postpone the switch-on of the anode voltage, so as to give the heaters some time to heat up properly. That is probably why your “music” appears only after a few tens of seconds in your speakers. But switching “off” is just as important – maybe even more important, and constitutes the other side of the same “coin”. Why the “damage” ? Because ther is a physical phenomenon that occurs, when you have a cold cathode and a high voltage on the anode. In such a scenario, an acceleration of heavy, positively charged ions of the particles of the residual gas takes place. There is no such thing as “perfect vacuum”. When produced, the vacuum tube gets nearly all of the gas pumped out from it’s inside, in order to achieve a high level of vacuum. But, there are traces of the gas particles left within the tube, as no pump is perfect. These traces of gas, when exposed to a strong electric field, tend to separate from their electrons (going “north” to the anode). Gas atoms convert into positively loaded, heavy Ions. Now, when we have a cold cathode, there is an absence of a heavy stream of electrons flowing from cathode to anode. Such a stream would normally swamp the Ions, that are interested in going southbound, to the cathode. But, alas, there is no such heavy stream of electrons, because the cathode is cold an not yet emitting. In the absence of “flow” of electrons rushing “northbound”, these heavy ions of gas, positively charged, begin to accelerated “southbound” in direction of the negatively charged cathod. They bombard the cathode. They have a big mass, so they are heavy (in comparison to an electron at least). So, they have significant kinetic energy. The higher the anode voltage, the higher the energy of the impact upon the cathode. Now, it just so happens that your preamp and driver tubes are indirectly heated ones (most probably). They are coated with a thin layer of delicate substances (oxides, etc), of fine oxides that enhance the emission properties of the cathode. Suffice it to say that this bombardment of the delicate oxides layer can sometimes damage or rather gradually degrade the oxide layer applied to the cathode, and hence gradually degrade the emission properties of your tubes. This phenomenon is called “cathode poisoning”. It takes place over a long period of time (switch-off cycles!) and can lead to a premature loss of emission by the tube. But there is more. If you bombard the cathode and these delicate oxide substances, they tend to dislodge from the cathode and are sprayed “all around”. And guess what, who is the next neighbor of the cathode ? It is the grid. It might so happen, that these oxides spray and accumulate on the grid, which is close by, adjacent to the cathode. If these oxides land and settle down on the grid … hmmm, …. guess what happens. Your grid is converted into an “unwanted cathode”. Your grid begins to possess emission properties (which should NOT posess!) – the more so, that is close to the cathode, and catches a bit of that high “temperature” that the cathode is heated up to. This in turn may lead to a phenomenon called “positive grid current”. Well, ok, you say. 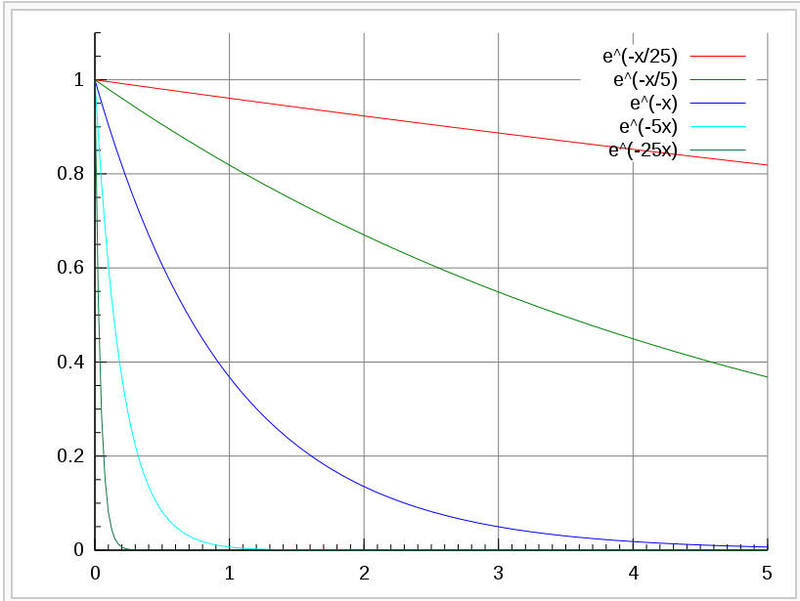 Positive grid current occurs when the grid is not biased with a negative voltage. Well, true, but not quite true. It might turn out, that your “cathodized” grid, can can actually start displaying symptoms of positive grid current much earlier, than would be expected when analyzing the technical parameters and graphs describing the tube. It may well be that you THINK that you are far away from positive grid current territory, when in fact you are already suffering from positive grid current. Especially annoying, if it takes place within circuits / topologies, that are not prepared to cope with it. So, just to be on the “safe” side – consider an additional relay (with a few additional elements, probably). A relay added to the anode HV DC filter circuit. A relay that is powered off the heater circuits, and normally, when powered up – establishes a connection between the HV DC filter output and your anodes. BUT, when power from the heater circuits dissapears ( you switched the amplifier off ), the anchor of your relay releases, instantaneously disconnects the anodes from the high voltage, and falls into its resting position, where it actually now connects those fully charged filter capacitors to an appropriately dimensioned power resistor, and hence helps to discharge the lethal charge of those capacitors, via shorting them, via the power resistor, to ground. So, please kindly consider – this one little relay may actually significantly increase the life span of your tubes. Powering OFF, or the ‘other side of the coin’ – is a much neglected issue in tube amplifiers. And Yes, if you have a three position “OFF” – “Standby” – “ON” power switch, it does make sense to switch off in two steps: a). from “ON” to the “Standby” position. Here – you wait for the music to totally stop playing. b). Once the music stops playing, switch from “Standby” to “OFF”. 4. When I switch on my tube amplifier, sometimes the fuses blow. At turn on. After replacing them – all is functioning just fine. Sometimes it even blows the fuse for my whole apartment. What’s wrong ? I would say, that this is a perfectly logical behavior of your fuses, although highly inconvenient from the user experience point of view. To understand what is happening, let’s try to “envision” the process of “switching on”. a). Your transformer, at the very short moment of actual switch on, has no magnetic field within it’s core. It simply did not “build up” yet. At the same time you have the “full thrust” of 230VAC (or 115VAC – whatever!) on the two ends of it’s primary, and that primary, believe me or not, has no more than something like 50~70 ohms of resistance. Divide the 230VAC by those poor little 50~70 ohms, and you arrive at the first major heart attack: the peak current surge, that can potentially travel through the primary coil, prior to it “building up” the magnetic field within the core, a prerequisite that is necessary for normal operation. This “build-up” process can take as long as 1 or 2 miliseconds. b). The secondary winding of your transformer is connected to a rectifier bridge. Producing the High Voltage for your anodes. But guess what! It is dirty, full of ripple voltage, so it needs to be filtered out. And your amp uses a fair amount of Capacitors to get rid of this “ripple” and to smooth out the voltage, so that you don’t get that annoying hum in your speakers. Alas, but there is no free lunch. The process of loading a capacitor to its “full voltage” requires energy. Significant current is needed to load up you capacitors. What you may, or may not realize though, is that within the first 3 miliseconds after switch-on, those caps have a voltage ZERO, and suddenly get a full thrust of say 400VDC on their ends. 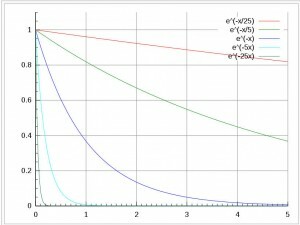 The process takes place according to an exponential decay function. Within a short period of time, at the very beginning of the process, capacitors, especially those BIG ones, constitute a short circuit, similar to a thick copper rod. An unbelievable impact current flows within a short period of time. As the “cap” gains on “voltage”, the current gradually subsides … after some 15 seconds everything is in balance, loaded, and an equilibrium is reached. Just to give you an idea, It is not uncommon to blow 10 Amper recifier bridges, when loading a filter, that is supposed to “deliver” a mere 200mA of current to the output tubes. The bigger the capacity of those caps, the stronger the impact of the surge current, which can reach a value of even 50 Ampers. Therefore, it is perfectly logical, that the fuses blow. But what can we do about it ? Obviously, it would be of benefit to find a means to “limit” the maximum surge just after switch-on, but in a fashion so that it does not interfere with the quality of our listening experience…. We need a “soft-start” mechanism. A “soft” and gradual entry, rise, up to the full anode voltage, with a limited current. The easiest way to do it is the way I do it on my workshop, when playing with new constructions. Ok, what I am about to say is certainly controversial, and even might arouse disgust and contempt between some of the purists … but I will venture this route anyway. Resistance (while in use): 230VAC * 230VAC / 1000W = 53 ohms. Resistance (cold filament): 4.3 ohm. Yes, … you have guessed correctly. This is a very brutal solution, but … a very quick and easy one.